I hope everything is going well with you! I am excellent today; Boston is finally warming up! Today I was thinking about who my hero is. The answer came quickly to me: My Father. My Dad is my hero for many reasons. My Dad is the stringest individual I know. 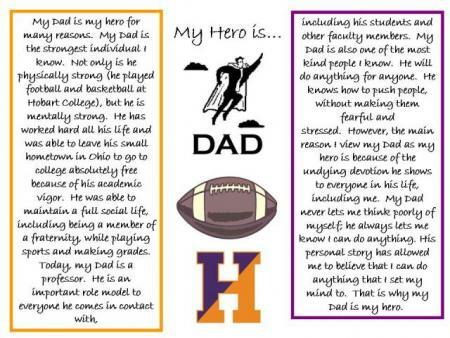 Not only is he physically strong (he played football and basketball at Hobart College), but he is mentally strong. He has worked hard all his life and was able to leave his small hometown in Ohio to go to college absolutely free because of his academic vigor. He was able to maintain a full social life, including being a member of a fraternity, while playing sports and making grades. Today, my Dad is a professor. He is an important role model to everyone he comes in contact with, including his students and other faculty members. My Dad is also one of the most kind people I know. He will do anything for anyone. He knows how to push people, without making them fearful and stressed. However, the main reason I view my Dad as my hero is because of the undying devotion he shows to everyone in his life, including me. My Dad never lets me think poorly of myself; he always lets me know I can do anything. His personal story has allowed me to believe that I can do anything that I set my mind to. That is why my Dad is my hero. I hope to hear from you soon!